Kinetic Motors owned MotoRoyale is reportedly launching the SWM Superdual T 600 ADV bike on 11th October. Expected price of the adventure tourer is around Rs 5 Lakhs. 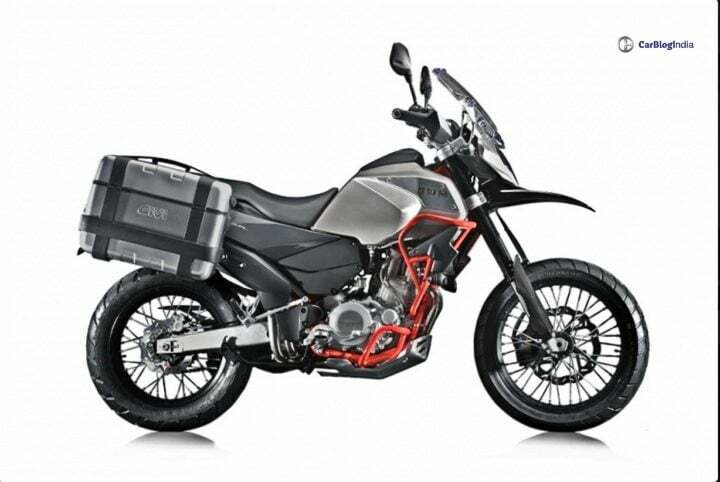 SWM Superdual T 600 Adventure Tourer is set to launch on 11th October, after 3 days. Currently, this brand falls under the Kinetic Group owned MotoRoyale. It comes in 2 variants – T and X. Both the bikes are CKD units and will come from China to the Kinetic’s plant in Aurangabad. It will most likely rival against the likes of Suzuki V-Strom 650 XT and Kawasaki Versys 650. For the past 1-2 years, many adventure tourers are reportedly coming to the Indian markets. As said, SWM Superdual T 600 comes in two variants – T and X. The ‘T’ variant is the base variant. The latter variant is more focused on off-roading and also gets bigger tires. The T variant gets 19-inch and 17-inch wheels, whereas the X gets 21-inch tires in the front and 18-inch at the rear. The ADV tourer comes with a 12V charging socket, fully digital speedometer, tall windshield, handguards, LED spotlights, luggage mounting rack, and engine guards. It also comes with an optional GT pack, which includes 2 Aluminium side case equipped on either side of the rear portion. Both the motorcycles are powered by a 600cc DOHC single-cylinder liquid cooled engine that produces 53.6 HP power and 53.5 Nm torque. The engine comes mated to a 6-speed gearbox. The SWM Superdual T 600 gets front and rear disc brakes with ABS. In the front, it uses USD hydraulic forks with an advanced axle and in the rear, it uses Progressive Soft Damp Type with Single Hydraulic Shock Absorber suspension. The ADV gets a ground clearance of 180 mm. It weighs 169 kgs in total. The fuel capacity of the tourer is 18 Litres, which means a rough riding range of around 450 kms on a full fuel tank. It gets dual-channel ABS as standard fitment with an easily switchable Enduro mode. The Superdual bikes will go against V-Strom 650 and Versys 650. Recently, the V-Strom 650 XT was launched in India. Considering the competitors of Superdual T, we expect the prices to be around Rs 5.5 Lakhs. Kinetic owned MotoRoyale currently has 5 international Bike brands under its name. It has MV Augusta, Norton, SWM, Hyosung, and FB Mondial. Barring Hyosung and MV August, other brands have never entered the Indian markets. These brands will manufacture bikes right from 300cc to 1000cc for the Indian markets.